Twintails: the glory of all mankind—or at least that is what first-year high school student Souji Mitsuka believes. At school, Souji spends most of his time daydreaming and rating girls' twintails, even going as far as creating a club dedicated to the hairstyle. His obsession does not go unnoticed, however; when monsters from outer space attack Earth and claim the world's twintails for themselves, a strange woman named Twoearle enlists Souji to fight back using twintails of his own! By transforming into the twin-tailed warrior Tail Red, Souji combats the vicious alien organization known as Ultimegil, whose main goal is to colonize Earth and steal everyone's spiritual energy, or "attribute power." Alongside fellow twin-tailed fighters Aika Tsube and Erina Shindou, Souji must find a way to defeat the invading army and defend the twintails he holds so dear. 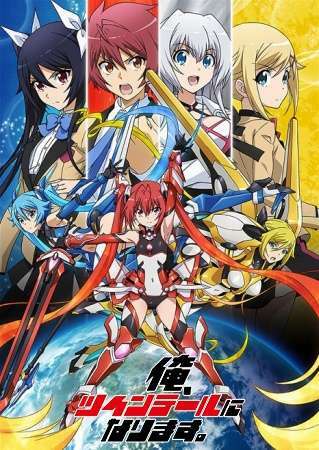 English: Gonna be the Twin-Tail!! Synonyms: Ore, Twin tails ni Narimasu.